I feel like we JUST finished out last DD week, and yet here it is again! Phew! I'll be honest, I don't know if I'm gonna be able to keep up this month. I'm going to try, though! This month our theme for The Digit-al Dozen is 5 Continents, 5 Days. I've decided to feature an animal from a different continent each day, and today we're doing Antarctica! Our animal? The Killer Whale, of course! I used two stamping plates for this one - MoYou London Enchanted Collection 05 for my whale nail, and 2JOY-011 for the accents. I also broke off my pointer nail last week and it hasn't grown back, so I'm actually rocking a falsie on that nail. I tried to shape it as best I could to make it match, but I'm not sure how successful I was haha.. Anyway, let me know what you think! And make sure to check out all the other awesome looks below! I really like the stamping here! Ohhh, I'm so excited to see all of your animal manicures this week!! These turned out so pretty! Awww, yes I love these! Also I love the animal theme, can't wait to see them all! Also the blog looks really nice! I feel like you redesigned and I missed it! This is so freaking adorable! 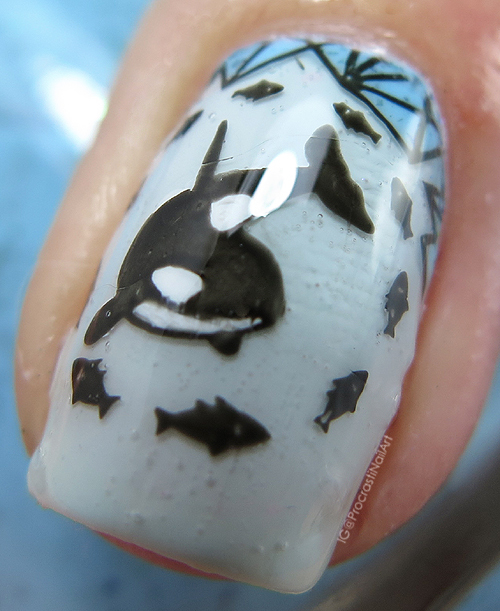 <3 I love the stamping images you selected - the ice cubes are absolutely perfect to go with the Killer Whale.